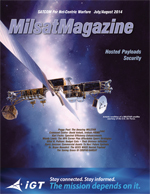 The first Milstar protected communications satellite, launched 20 years ago on February 7, 1994, gave U.S. national and defense leaders a new capability: Assured communications day or night, without detection or interception under any level of military conflict. Colonel David Anhalt (U.S. Air Force, retired), joined Iridium as Vice President and General Manager of Iridium PRIME(SM) in 2013. He is a recognized leader in the hosted payload industry and will spearhead business development for Iridium PRIME, focusing on customer acquisition and technology partnerships. It is a fact of life for those in the satellite industry that satellite transponder space is a precious commodity. Even the introduction of the new high throughput satellite (HTS) constellations will not change this reality. At the May 22nd Hosted Payload Alliance baoard meeting, which was held in conjunction with the Space Symposium in Colorado Springs, Colorado, Mr. Doug Loverro, Deputy Assistant Secretary of Defense for Space Policy, discussed the next-generation architecture for the Department of Defense. He told the group that over the next few months, government agencies are developing the strategy for this new architecture, which must integrate Air, Land, Sea and Cyber resources in a way that cannot be contested. One of the more disturbing bits of data in Space Foundatin’s The Space Report 2014 concerns the continued slashing of federal space budgets by the United States. For the first time since the Space Foundation began tracking this data, global government spending on space declined in 2013—and with most other countries either maintaining or increasing their space spending, the global decline can be laid entirely at the feet of the U.S. government. The Global War on Terror, program overruns, and increasing demand for new capabilities has placed an ever increasing strain on National Space Assets, from communications satellites to Earth and space observing systems. This strain has also created an opportunity. With the goal of increasing the number and capability of space based payloads at reduced costs compared to dedicated systems the concept of “Hosted Payloads”  has recently been attracting the attention of both Government and Industry as an example of how the government can do things differently and focus on capabilities, not systems. The Wide Area Augmentation System (WAAS) uses a system of dozens of ground stations in various CONUS locations to provide necessary augmentations to the GPS standard positioning navigation signal. Two Galileo Initial Operational Capability (IOC) satellites will soon be launched from Kourou, French Guiana (July/August 2014). While most people are aware that Galileo will provide a new SatNav system, it will also offer a new breakthrough Search and Rescue (SAR) capability. As the strategies for the nexgen space mission area architectures are being discussed and developed, there are expectations that government and military teamwork with commercial satellite operators and manufacturers will enable more affordable and resilient solutions. Hosted payloads offer a cost-effective way to ensure a broad range of U.S. government capabilities are delivered into space. However, there are other means, as well, for the U.S. government to work with industry to build in the resilience that is derived from disaggregating important assets.